This fortnight Patter has shared a Hymn I am not familiar with and it was not in either of the olde hymn books I have but I did find it in a newer one because the writer of the hymn lived in the 20th century, unlike a lot of the other hymn writers from much earlier times. I would encourage you to please visit Patter's blog HERE to read about the writer of the hymn and to read Patter's devotional thoughts. When I read what hymn we were to work with, I did my usual search on Bible Gateway for what scripture I would share in my art and decided on Psalm 139:1. Then last night ( which was a day later ), I sat to do my Bible Study preparation ready for this weeks KYB Study ( Know Your Bible - studies for women here in Australia ). We are studying some of the Psalms and you possibly will guess... yes this week we are studying Psalm 139. He know me so intimately yet, He loves me and forgives me. What an awesome God we worship. 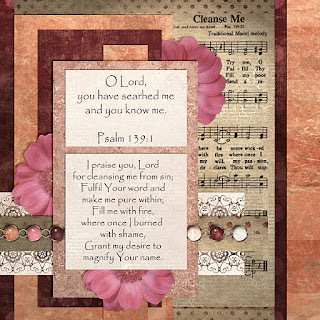 On my digital page I have shared Psalm 139:1 and the second verse from the hymn as it spoke to me the most - I was once filled with shame when I first met Jesus and still am at times when the Lord reveals my sins to me. Now I praise Him that he cleanses me.... washes me whiter than snow in His own blood. Beautiful page -- and as pretty as it is, the glimpse of your heart as you shared is even more lovely. Thanks so much for sharing. Anne-Marie, what a delightful page. So glad you linked up. Long as I am here, I think it is time to follow you blog. Blessings dear one. I really like this Anne-Marie. Love the layers of paper. Beautifully done.